This J-Link model supports VCOM. Note: The real baudrate and the selected one should not deviate more than 3% to guarantee proper communication on VCOM. J-Link OB starts driving its VCOM output pins as soon as it receives a "set baudrate" command. This command is send by the PC as soon as a COM port is opened. Unfortunately, there is no specific command / packet etc. send by the PC in case a COM port is opened. Therefore the "set baudrate" approach is the only one to detect COM port activity. J-Link OB stops driving the RTS pin if J-Link OB detects that hardware flow control is not used on the target side. Note: This setting gets active immediately and survives a power-cycle of J-Link. The J-Link-OB-SAM3U is a J-Link-OB based on the Microchip SAM3U series device. There are different implementations of the J-Link-OB-SAM3U on various eval boards. The following only applies to implementations which incorporate VCOM support as well as MSD drag & drop programming support. Unfortunately, only 4 of the 6 EPs support USB packet sizes of up to 512 bytes. The EPs used for VCOM are the ones that do not support 512 byte packet sizes but only 64 bytes. As the J-Link-OB-SAM3U enumerates as a USB Hi-Speed device, by USB spec. all endpoints need to support packets sizes up to 512 bytes. This cannot be fulfilled on the SAM3U when using all 3 components. While this is no problem under Windows and Linux, it is a problem under Mac OS X. OS X will not send packages on the VCOM port that are bigger than 64 bytes in size. Such packages are "swallowed" silently and only a message is output in the syslog of OS X. No errors etc. are returned on the system API level. From the J-Link firmware side it is always made sure that no packets bigger than 64 bytes are sent on the VCOM port. If necessary, J-Link splits a transaction into multiple packets. If both are needed the MSD and VCOM component, please make sure that no packets bigger than 64 bytes are sent on the VCOM port, by your application. 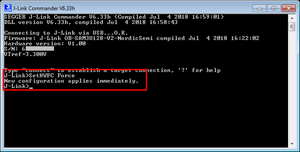 execute the following command (without quotes): "MSDDisable"
To re-enable the MSD component, please perform the same procedure as above but use the "MSDEnable" command instead. The J-Link-OB-RX621-ARM-SWD is a J-Link-OB based on the Renesas RX621 series devices which is capable of debugging ARM based target devices like the Renesas Synergy series devices. The problem only occurred if the J-Link was enumerating directly inside the VirtualBox guest OS. If it initially enumerated under the host OS and was connected to the VirtualBox guest OS later on, it worked fine. This J-Link-OB model for example is used on the Renesas Synergy development kits. As the fix requires to replace the bootloader of the J-Link OB, which can result (even if very unlikely) in a unusable J-Link-OB, the fix for this is not automatically applied when a new version of the J-Link software is installed. In the following it is described how to replace the bootloader of the J-Link-OB. The following should only be done if you are affected by this problem. Please make sure that power supply to the J-Link-OB is stable. Unstable power supply during bootloader replacement can result in an unusable J-Link-OB. This page was last modified on 26 March 2019, at 10:22.